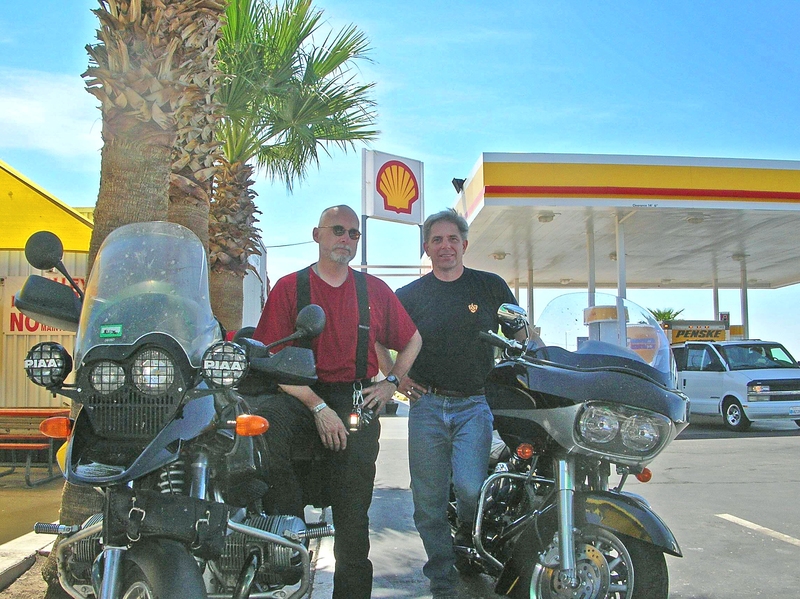 August 2008: Fleeing the desert heat, I refuel the motorcycle at the Shell station in Gila Bend, Arizona. Interstate 8 is a lonely road across the heat sink between Casa Grande in the east and Yuma to the west and this Gila Bend station is a well-known oasis to us; it’s a truck stop on the edge of town and a good place to stop, guzzle Gatorade, pause in the shade, and stuff your neck bandanna with ice in preparation for the next leg of desert travel. It’s 102 degrees and rising. I park the bike in the spotty shade of a palm tree and we put our helmets and riding jackets on one of the three aluminum picnic tables beneath an awning. In the desert, finding shade is the key, especially when you’re on a motorcycle; otherwise, the sun bakes the seat and handlebars and you feel as if you’re climbing into an oven when you saddle up. And you always put your helmet in shade, or, better yet, take it with you into the air-conditioned store. Leave your helmet to bake during a rest stop just once and you’ll never do it again. This station used to be a Texaco, but corporate deals have turned it into a Shell. Lots of vacationers stop here, many recreational vehicles and SUVs, whose occupants spill out of their air-conditioned compartments in search of drinks and bathrooms and look shocked as they’re hit by the heat. There’s no such surprise for a motorcycle rider. Linda wanders back inside the store and I stay to watch the bike, our gear, and the land beyond. A few miles away, the desert is silent except for the wind; here, the station’s air conditioner rattles and a diesel idles out back. The relentless heat and remote isolation of Gila Bend never fail to move me. I marvel at how far removed this place is, lost in the desert, and how difficult it must have been for early travelers without gas-powered engines, air conditioning, or ice. As I sit there, heat-sapped and lost in thought, a rider on black Harley-Davidson touring bike pulls in and shuts down behind my BMW. Motorcycle riders commonly seek each other out at rest stops and such places; it’s a chance to swap stories, compare destinations, and sometimes see if the other guy is suffering as much as you are. The Harley rider takes off his helmet, revealing thick gray hair, and relaxes a moment on the saddle. “Nice bike,” he says to me, in greeting. “No kidding?” Cleveland is more than 2,000 miles from here. “My parents live in Bedford Heights,” a suburb. “I grew up in Bedford,” he says. “Did you go to Bedford High?” I ask.